In this post, we are talking about how you can check if the phone is unlocked without using the sim card swap method. But before we jump deeper into the article you must know what difference does it make if your phone is locked or unlocked. And no we are not discussing here your lock screen instead, the lock which enables you to use different network carriers on your smartphones. Almost all the Android and iPhones you purchase from the market are unlocked meaning you can use any sim card of your choice to avail the network services and also change the sim card if you don’t like the service or whatever the reason may be. But if you didn’t know that your newly bought smartphone is not unlocked then when you will try to change the sim cards or try to use a different network carrier, it won’t show any signal. This is what is called a locked phone. Especially nowadays, when almost each of us has 3-4 sim cards and keep changing them as new plan rolls out. So, it is really important to check before buying a new smartphone if the phone is unlocked or not. And also nowadays people are travelling to foreign countries regularly so you need to informed on whether your mobile phone will make calls after you reach your destination or not or whether a new sim card from a different country will work in your smartphone or not. So, There are two methods to check whether your phone is unlocked or not. 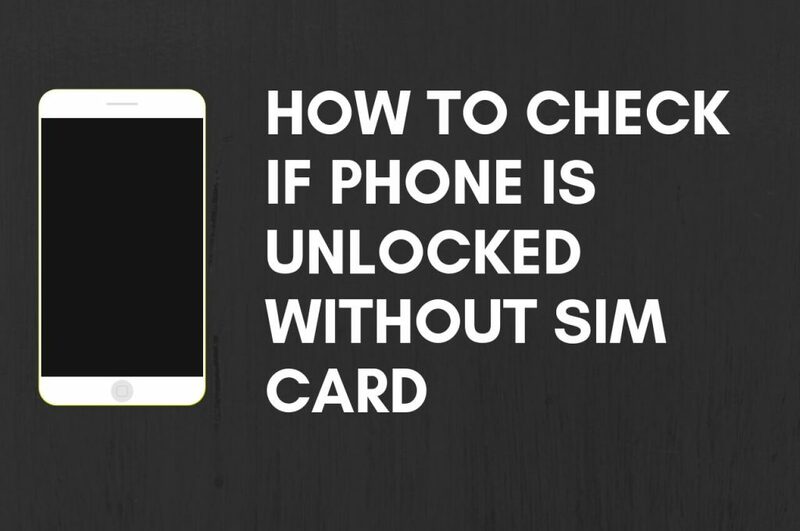 In this tutorial, I am going to tell you the step-by-step process of How You Can Check if Your Phone is Unlocked Without Sim Card. This method uses the IMEI number of the phone you are checking. So, the first thing you want is the IMEI number of the phone you want to check. You don’t know the IMEI number? You just have to type this code *#06# and you will be displayed the IMEI number of the phone on your screen. It will ask for your IMEI number and when you press enter it will show you the information related to your device. On the left-hand side, it shows you the option of unlocking your phone. This is generally a paid service. Once you fill out all your details and check out they will provide you with the information about your phone is locked or unlocked and will also unlock your phone if it’s locked. In some cases like for my Nokia phone, they showed different free checks so you can try for your mobile and see if your mobile phone is locked or unlocked. I know you must be thinking but this is a paid method. Well, sometimes when you have to travel to a different country and you don’t know if the foreign network carrier would work or not in your mobile it is a wise decision to check beforehand by paying a few bucks. At least you would not be in an ugly situation in a foreign land. That’s why it is better to check if the phone is Unlocked for foreign carriers or not.